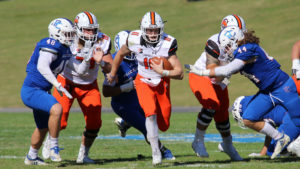 Clinton, S.C – Daniel Smith ran for three first half scores, helping Campbell secure its first Big South Conference football win, downing Presbyterian on the road 34-6 Saturday at Bailey Memorial Stadium. Campbell (6-4, 1-3 Big South) notched back-to-back winning seasons for the first time in its modern history (since 2008) with the victory. In the program’s 11th season and first as a Big South member, the Camels earned their first win in the league, spending the program’s first 10 seasons in the Pioneer Football League (2008-17). Jordan Morgan put PC on the board with a five yard keeper, but Aaron Blockmon quieted the rally, returning the ensuing kickoff 88 yards for the touchdown. The kick return TD was the second of Blockmon’s career, and the redshirt senior’s first since his 2015 freshman season. The score tied Blockmon with Jonathon Rogers for the most kick return TDs in CU history.